Coat: eBay/'Vintage' - similar here. Top: Zara - similar here. Rings: Astrid and Miyu. Shoes: M&S. Trousers: Topshop. Earrings: Dior - ASOS alternative here. Sunglasses: Miu Miu. Bag: Chanel. A super-quick outfit post this evening; Charlotte snapped these photos for me after I moseyed on over to Somerset House on the first day of Fashion Week for an 'office social' with my management and the other girls. I quite literally threw this outfit together that morning, with a taxi in the driveway ferociously beeping for me to get a move on. 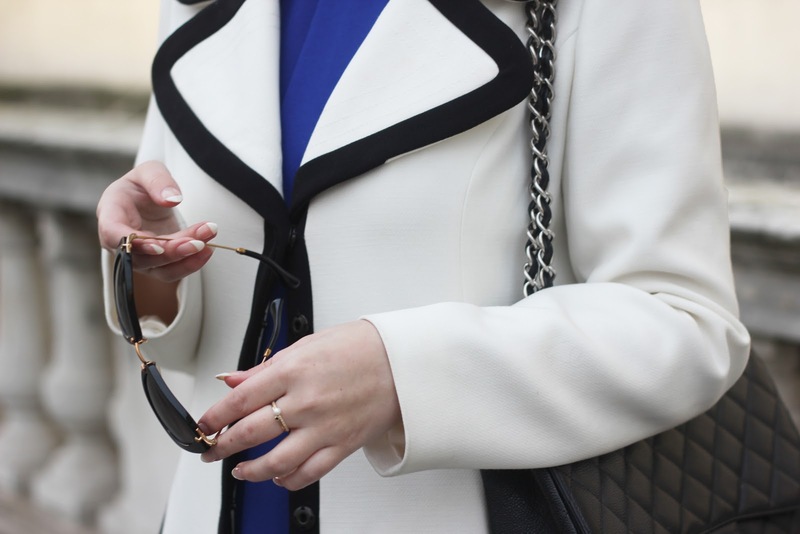 I ended up wearing a Zara cobalt blue top, Miu Miu sunglasses, an 'old' pair of similarly coloured heels from M&S, Dior earrings, a pair of Topshop leather trousers, my dear Chanel, and a vintage white coat that I found on eBay last year. I'm undoubtedly an advocate for mixing high-street and vintage pieces with designer accessories, and so this outfit accidentally ended up epitomising this. Wow what a find that stunning coat was! It's out of this world! those sunglasses are so lovely. I have seen them on several youtubers recently. It must be the new trend or something. Gorgeous coat! I really love the blue details. Love the outfit and I love how simple but chic it is and I'd totally wear so etching like this. So exciting you got to be on TV. Obsessed with your coat and cobalt heels. You look so chic! such a gorgeous coat! I always love your outfits!